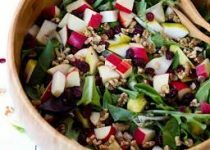 This is a great salad to serve for any autumn meal. Maple Syrup - 1 Tbsp. Preheat the oven to 350 degrees. Spread the walnuts out on a baking sheet in a single layer. Bake for 8 to 10 minutes in the preheated oven, or until lightly toasted. In a glass mason jar, combine the apple cider & garlic vinaigrette, maple syrup, Dijon mustard and salt & pepper to taste. Seal the lid and shake until all ingredients are well combined. Adjust flavour to taste, if necessary. For best flavour, allow the dressing to marinate for at least 30 minutes before serving over your greens. In a salad bowl, toss together the greens with dressing to coat. 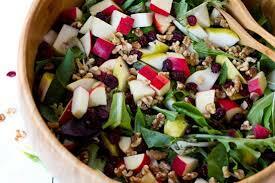 Sprinkle with roasted walnuts, dried cranberries, red onions and sliced apples. Optional: Add cooked turkey pieces.